Squirrel Eating an Acorn. Taylar, I. (2009). The acorns of the Northern Red Oak have provided food to humans and animals alike. Cooked acorns were a staple food for several Native American tribes, like the Potawatomi. However, the acorns of the Northern Red Oak contain bitter tannins. These tannins can be removed with multiple washings, but this also causes many minerals to be lost. It can take several days or even weeks to properly leach the whole seeds. Often, they were placed in a cloth bag and put into the current of a stream. Leaching the powder of acorns is a much quicker method. A simple taste test can be preformed to see if the tannin has been leached out because the bitterness will no longer be there. The Potawatomi and other Indians, who knew how to remove the tannin, ground them into meal for food. The acorns were dried, ground into a power, used as a thickening in stews, or mixed with cereals in bread making. However, it was said that it takes a mighty red oak to make a Potawatomi pancake. 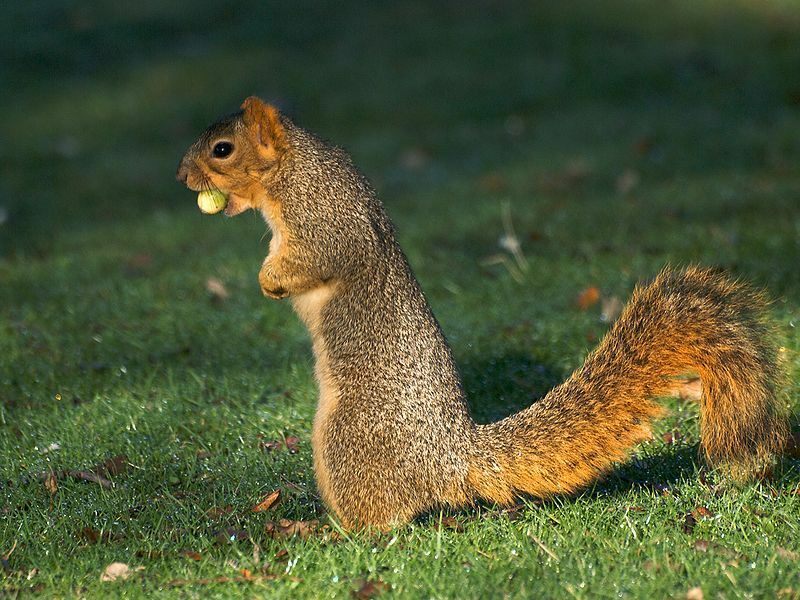 Many species of squirrel consume acorns as a food source. During autumn, their main diet consists of nuts and seeds. Squirrels store large quantities of their harvested acorns to see them through the winter when food is scarce. Thus, a symbiotic relationship is formed: the squirrels consume the energy-rich acorns and the Northern Red Oaks’ acorns are planted in the ground. Because of the bitter tannins in the Northern Red Oak acorn, often, only the top half is eaten. This leaves the embryo intact and allows for these damaged acorns to germinate. This also aids the regeneration and dispersal of oaks. Acorns are also an important source of food to many birds, like the bobwhite, the redheaded woodpecker, the red-bellied woodpecker, the blue jay, the tufted titmouse, the ruffled grouse, and many others. Most notable is the wild turkey, who can consume more than 221 acorns in one meal! Acorns have even been used to fatten pigs and poultry. White-tailed deer, as well as elk, hares, cottontail rabbits, and moose, often browse leaves and young seedlings of the Northern Red Oak. Although squirrels were beneficial to the Northern Red oak, white-tailed deer have been shown to hinder Northern Red Oak regeneration. If the levels of white-tailed deer were too high, this would mean that the herbivory levels were also too high. Thus, many Northern Red Oak seedlings could not survive beyond browseable heights. Therefore, the density of white-tailed deer must be controlled in order to maintain the population of Northern Red Oaks.